Scientists at the Vetmeduni Vienna examined the telomere length of captive African grey parrots. They found that the telomere lengths of single parrots were shorter than those housed with a companion parrot, which supports the hypothesis that social stress can interfere with cellular aging and a particular type of DNA repair. It suggests that telomeres may provide a biomarker for assessing exposure to social stress. The findings have been published in the journal PLOS ONE. In captivity, grey parrots are often kept in social isolation, which can have detrimental effects on their health and wellbeing. So far there have not been any studies on the effects of long term social isolation from conspecifics on cellular aging. Telomeres shorten with each cell division, and once a critical length is reached, cells are unable to divide further (a stage known as 'replicative senescence'). Although cellular senescence is a useful mechanism to eliminate worn-out cells, it appears to contribute to aging and mortality. Several studies suggest that telomere shortening is accelerated by stress, but until now, no studies have examined the effects of social isolation on telomere shortening. To test whether social isolation accelerates telomere shortening, Denise Aydinonat, a doctorate student at the Vetmeduni Vienna, conducted a study using DNA samples that she collected from African grey parrots during routine check-ups. 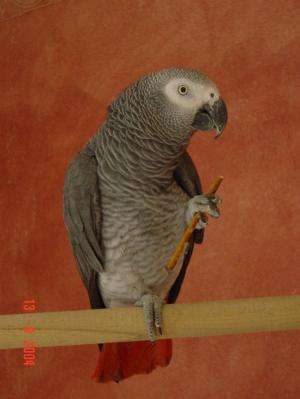 African greys are highly social birds, but they are often reared and kept in isolation from other parrots (even though such conditions are illegal in Austria). She and her collaborators compared the telomere lengths of single birds versus pair-housed individuals with a broad range of ages (from 1 to 45 years). Not surprisingly, the telomere lengths of older birds were shorter compared to younger birds, regardless of their housing. However, the important finding of the study was that single-housed birds had shorter telomeres than pair-housed individuals of the same age group. "Studies on humans suggest that people who have experienced high levels of social stress and deprivation have shorter telomeres," says Dustin Penn from the Konrad Lorenz Institute of Ethology at the Vetmeduni Vienna. "But this study is the first to examine the effects of social isolation on telomere length in any species." Penn and his team previously conducted experiments on mice, which were the first to show that exposure to crowding stress causes telomere shortening. He points out that this new finding suggests that both extremes of social conditions affect telomere attrition. However, he also cautions "further 'longitudinal' studies, in which changes in telomeres of the same individuals over time, are needed to investigate the consequences of stress on telomere shortening and the subsequent effects on health and longevity." Co-author, Franz Schwarzenberger from the Department of Biomedical Sciences at the Vetmeduni Vienna, points out that their results are exciting because they suggest, "telomere length may be useful as a 'biomarker' that enables to assess an individual's exposure to chronic social stress." Does depression contribute to the aging process? If you allow yourself to postulate two forms of isolation - voluntary and involuntary isolation - then you have correlations between stress and telomeres for two forms of isolation. Should this effect reflect the stress involved? For a pack or flock animal, loneliness is stressful, but for animals which prefer solitude, then company is stressful. This is well demonstrated by the two types of humans, extroverts who need company and introverts who crave solitude. Each find the others preferred condition stressful. If this is demonstrated, then it is stress which relates to telomere shortening, not isolation per se. You eliminate the variable "preference" (choice) so anything you attribute to stress is independent from the variable removed. "Preference" harbors a condition you want to eliminate. In a world where "solitude" does not exist genetics by chance gives birth to an "introvert". Q.Does this "born introvert" die prematurely from stress? Q.Does this "born introvert" enjoy longevity from adaption? Q. What were the teleomeres doing all this time during the life span implied by the questions above? That is a study both of us can considered.